If you’re a backpacker exploring Southeast Asia and have more time than money on your hands then you’ll probably have to use bus transportation within and between countries at some point. Fortunately, the buses nowadays aren’t too shabby and based on the horror stories that I’ve read on the interwebs these buses are worlds away from what they were just a few years ago. You can ask these guys for a ride if don’t have enough money for bus fare. 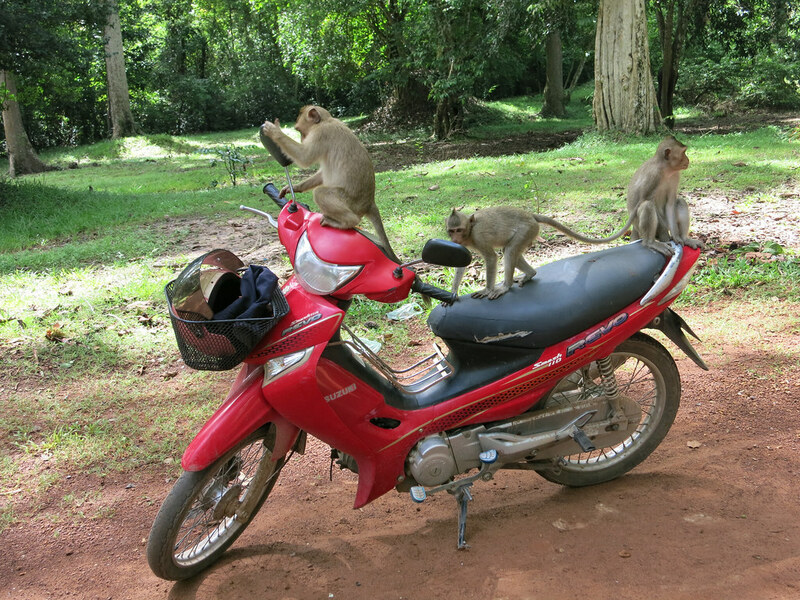 After extensive research we decided that the bus route from Bangkok to Siem Reap would be a safe, economical, and comfortable enough option for us. It would save us about $200 which is about 100 nights of accommodation in Cambodia. I exaggerate. It’s more like 15 nights. Anyway it made sense for us so we gave it a try. Since it’s a fairly new service there isn’t much information out there so we’ll share our experience. First thing’s first, buy your bus ticket. Supposedly you can buy your ticket online but this didn’t work for us. I’m not sure if the issue was with my US credit card or a flaw with the online ticketing system, but I couldn’t complete the transaction online, so we had to go to the bus station to make the purchase. The bus terminal is called Mochit2. Don’t get it confused with the Mochit BTS train station or you’ll be waiting a long time for a bus that will never come. At the bus terminal the ticket booth is inside, on the first floor. There are booths outside too, but the one you’re looking for is inside underneath a large LCD screen. 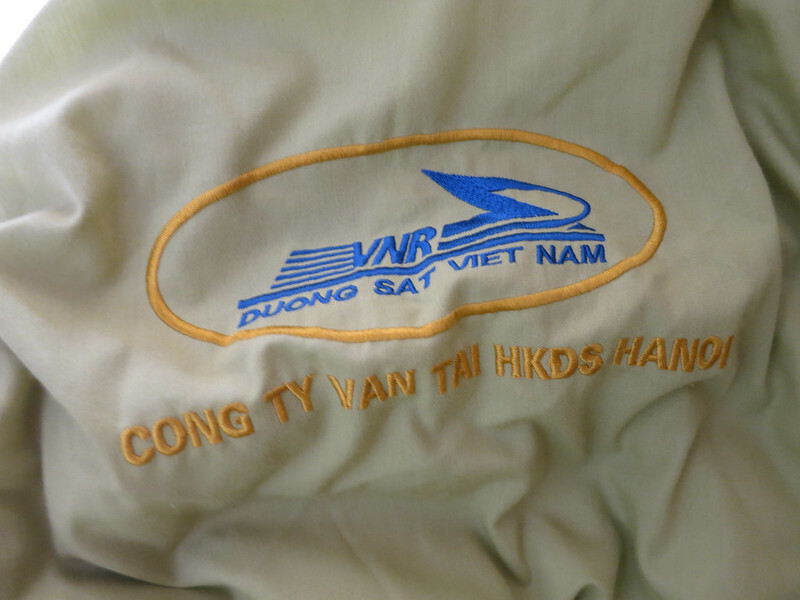 It’s actually called The Transport Company and there will be a sign in English with route information. The blue sign is the one you’re looking for, but it’s so small that you’ll have better luck finding that giant LED sign above it. The guy at the window spoke English well enough to clarify our ticket information several times before he printed and sold us the tickets. He was surprisingly thorough unlike other bus ticket sellers we’ve dealt with around the world. 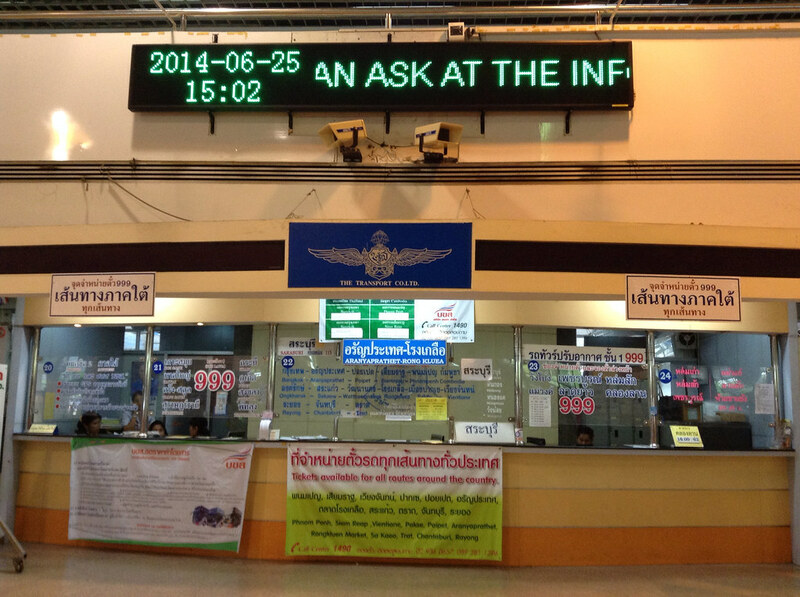 He checked our departure date, time, destination, and names several times. Bring your passport or at least a copy of it. He asked for ours and typed in our names for the tickets. 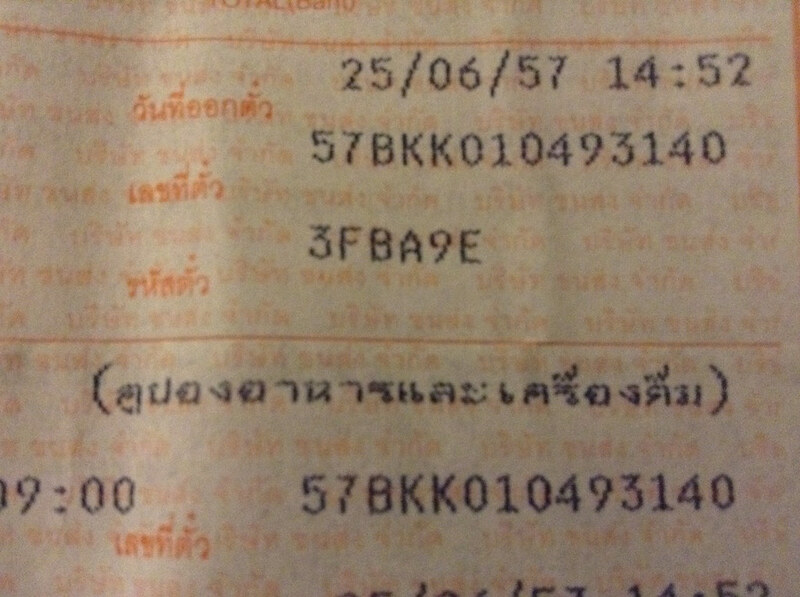 Each ticket is 750 baht; the price for a one way trip with breakfast and lunch served on the bus. Close-up shot of our bus tickets. The next day we arrived 45 minutes early to wait for our bus. I don’t like to rush for international travel, so I’d rather get there with time to spare. There are a bunch of food options at the station and I highly recommend that you stock up on snacks if you’re a big eater because the bus does not make any pit stops and the provided meals are meager. 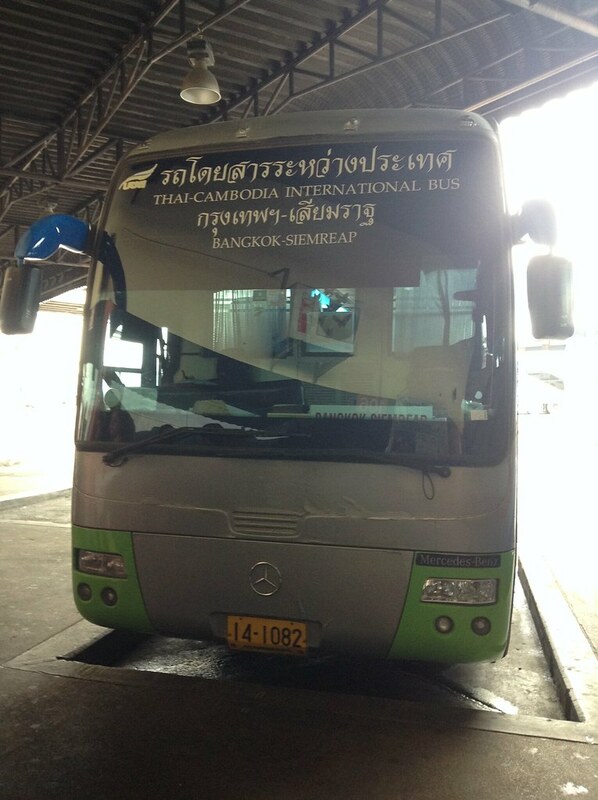 The bus arrived at platform 106 before 9:00am and after loading luggage and passengers we were on our way by 9:05am. Not bad for timing. Did I mention that it was a Mercedes-Benz bus? Cuz we’re bus balllerrrrrzzzzz. 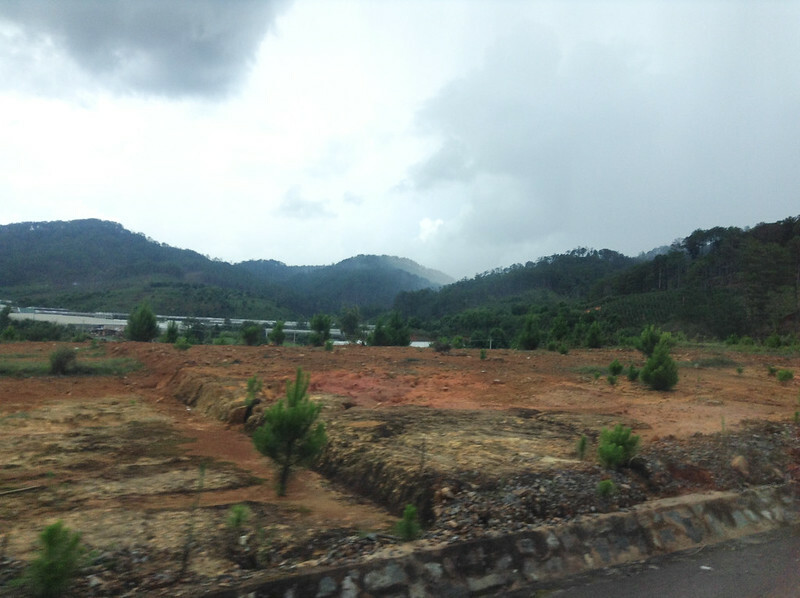 We have a good reason why we try to avoid bus travel through Vietnam, and I was once again reminded of this as we started our very long day of bus and train rides from Dalat to Danang via Nha Trang. 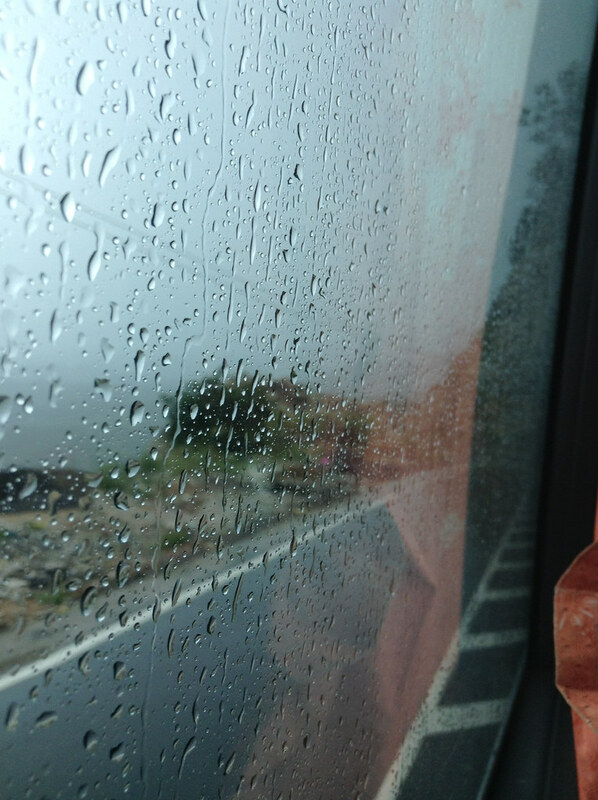 On this particular ancient bus, we were blessed with a schizo driver who crawled up the mountain roads at a snail’s pace and then hurtled down steep windy paths, careening around the bends and throwing the passengers from side to side. It felt like we were being shaken around in a tin can. The driver honked incessantly, warning mopeds in front of him that he would kill them if they didn’t get out of his way. That’s Vietnamese driving for you, where the biggest vehicle rules the road and pedestrians are the lowest on the food chain. Villages on the way down the mountain. Waterfalls from the rain pouring down the side of the mountain. The bus hugged the sides of the mountain as it shot down the road. By the time we stopped for lunch, the inside of the bus smelled like burning brake pads. When the driver ambled back to his bus, everyone scrambled back on after him as if the bus would leave without them. 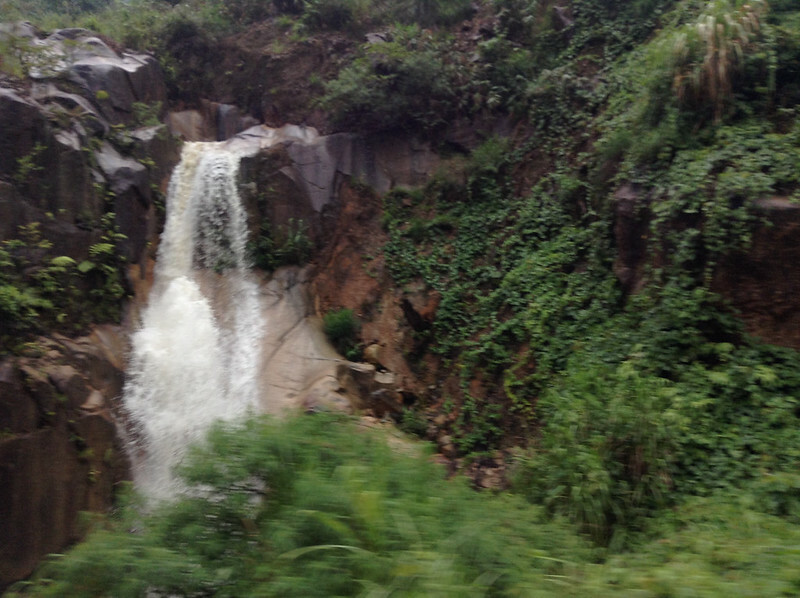 We shot down the mountain past small waterfalls before we swerved and stopped to avoid hitting a mother and son on a moped. 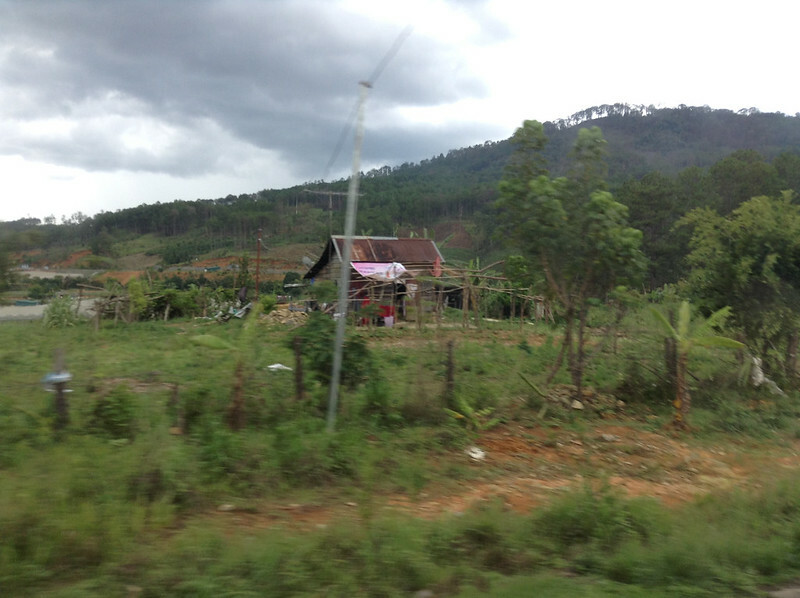 They watched in stunned silence from the side of the road as our bus took off again. This past weekend I went to visit my darling little nephew in Pennsylvania. He learned to say our names recently so I had to reward the milestone with a personal visit. KS couldn’t join because she hates children.